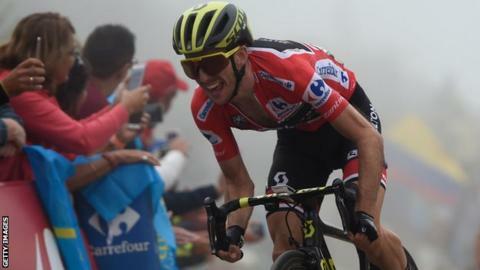 Britain’s Simon Yates increased his lead at the Vuelta a Espana as Rohan Dennis earned a convincing win in Tuesday’s individual time trial. BMC Racing Team rider Dennis clocked a time of 37 minutes 57 seconds to win stage 16 by 50 seconds. Yates finished almost a minute and half behind the Australian, but increased his overall lead to 33 seconds as Nairo Quintana and Alejandro Valverde faded. Valverde remains second overall, with Steven Kruijswijk climbing to third. Yates had opened a 26-second lead heading into the 32km time trial from Santillana del Mar to Torrelavega in Cantabria. The Mitchelton-Scott rider was able to edge out nearest rival Valverde to finish 13th on Tuesday, while Quintana lost 42 seconds on the Englishman. Wednesday’s 17th stage is a 157km road race from Getxo to Alto del Balcon de Bizkaia, with three mountain stages to come in the final five. 5. Enric Mas (Spa/Quick-Step Floors) +1min 30secs.